"Evan will trick you into thinking that heï¿½s only teaching you to pass the driving test. 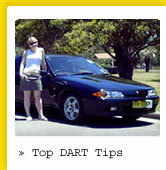 But without you noticing, he will also teach you how to be a responsible, competent and confident driver. I passed the test first go. Donï¿½t think twice about giving him a call." 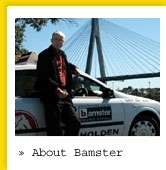 Bamster is a driving school servicing the Inner West of Sydney and surrounding areas. Our apologies but Bamster is downsizing. As a result we no longer offer packages or large numbers of lessons to new students. This will not affect students who have already signed up with Bamster, although lesson options will start to reduce over time. Also we will not be offering "3 for 1" for learners under 25 years old. If you are just wanting one or two lessons as a start up or a check up or a test prep we can probably still help. In any event feel free to call/text 0411887403 or use our contact link. We are accredited to the national Keys 2 Drive program which aims at having zero harm for the first 6 months of P plates. And there's a free lesson in it for you as well! (subject to conditions). Our apologies but WE NO LONGER OFFER "3 FOR 1" FOR YOUR LOG BOOK HOURS. This will affect you if you are planning on doing your test before you turn 25 AND you have not already done 10 hours with a driving instructor AND you are struggling to reach 120 hours in your log book. 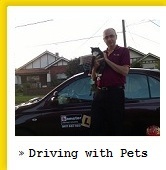 We are members of the NSW Driver Trainers Association (and we have Public Liability Insurance). We have a C (car) class MANUAL vehicle and an automatic vehicle. We can also give lessons in your automatic or manual vehicle as long as your comprehensive insurance is up to date and allows learner drivers. You can arrange a lesson with Bamster either by booking online or calling us on 0411 887 403. » AUTO ONE: Right Gear! Right Advice! In Chipping Norton, Chatswood, Kensington and all over Australia. » MKG Solicitors, Newtown. 8004 9557. » GoGet: More convenient than car rental. "You make a hundred driving decisions every minute. Of COURSE you are going to make mistakes. The question is: have you allowed for them?"